I was born in Hyogo,Japan 1988. This is my portfolio website. 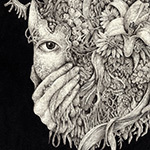 These artworks drawn by"Millipen"(Drawing pens). I'd be pleased if you like those. Sorry, I am not good at English. But if you send me a message, I will try to read it. Copyright © 2016 Daiki Fujimori.